French presidential candidate Emmanuel Macron's team blasted a "massive and coordinated hacking attack" against his campaign after a flood of internal documents were released online barely 24 hours before the election. The centrist candidate's furious staff said the release late Friday of thousands of emails, accounting documents and other files was an attempt at "democratic destabilisation, like that seen during the last presidential campaign in the United States". The documents spread on social media just before midnight on Friday -- when 39-year-old Macron and his far-right rival Marine Le Pen officially wrapped up campaigning for Sunday's decisive run-off vote -- with his aides calling the leak "unprecedented in a French electoral campaign". Hillary Clinton has alleged Russian hacking of her campaign's emails was partly to blame for her defeat in last year's US presidential election to Donald Trump. The leak, posted by someone calling themselves EMLEAKS, came as an 11th-hour twist in what has proved to be one of the most drama-packed elections in French history. 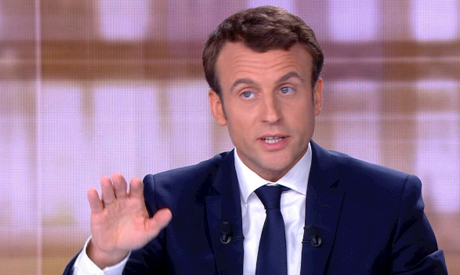 Macron's team said the files were stolen weeks ago when several officials from his En Marche party had their personal and work emails hacked -- one of "an intense and repeated" series of cyber-attacks against Macron since the launch of the campaign. "Clearly, the documents arising from the hacking are all lawful and show the normal functioning of a presidential campaign," aides said in a statement. But they warned that whoever was behind the leak had mixed fake documents with real ones "in order to sow doubt and disinformation". The WikiLeaks website posted a link on Twitter to the trove of documents, saying it was not responsible for the leak but that it was "examining" parts of the cache, amounting to around nine gigabytes of data in total. Last month cybersecurity research group Trend Micro said Russian hackers called Pawn Storm had targeted Macron's campaign, using "phishing" techniques to try to steal personal data. Senior Le Pen aide Florian Philippot suggested on Twitter that the leak might contain information that the media had deliberately suppressed. France's presidential election commission advised media not to publish details of the documents, warning that publication could lead to criminal charges and that some of the documents were probably fake. The commission is due to meet later Saturday to discuss the hack. The upset came at the end of a frantic final day of campaigning and as fresh security concerns emerged following the arrest of a suspected extremist. Polls released earlier Friday had showed Macron gaining momentum, forecasting victory for the pro-European, pro-business former banker with around 62 percent to 38 percent for Le Pen. He and Le Pen -- who is hoping to ride a global wave of anti-establishment anger to the Elysee Palace -- have offered starkly different visions for France during a campaign that has been closely watched in Europe and around the world. After a policeman was shot dead in an Islamic State-claimed attack on Paris's Champs-Elysees three days before the first election round last month, jitters rose again when police arrested a suspected extremist near a military airbase on Friday. Guns were discovered as well as a pledge of allegiance to IS and several of the group's flags, sources close to the case told AFP after the arrest in Evreux, north of Paris. The suspect, a 34-year-old Muslim convert, was arrested early Friday after police found his car near the base. In another major security incident on Friday, Greenpeace activists partially scaled the Eiffel Tower to hang a giant anti-Le Pen banner saying "Liberty, Equality, Fraternity" and "#resist". Paris police said the stunt exposed "flaws" in the security surrounding the world-famous monument, and city authorities announced immediate measures to reinforce patrols at the site. Le Pen has tried to portray Macron as being soft on security and Islamic fundamentalism, playing to the concerns of many of her supporters after a string of terror attacks in France that have killed more than 230 people since 2015. She has said she wants to copy Britain's example and hold a referendum on France's EU membership, sending alarm bells ringing in capitals across the bloc. In the first round of the election, she finished second behind Macron on 21.3 percent after softening the FN's image over the past six years -- but without fully removing doubts about the party's core beliefs. A former economy minister under Socialist President Francois Hollande, Macron quit the government last August to concentrate on his new political movement En Marche, which has drawn 250,000 members in 12 months. He won high-profile backing from former US president Barack Obama on Thursday, who said in a video that Macron "appeals to people's hopes and not their fears".